Jagers completed | Glory Eagles de l'Empereur! That’s the first unit done, at any rate. 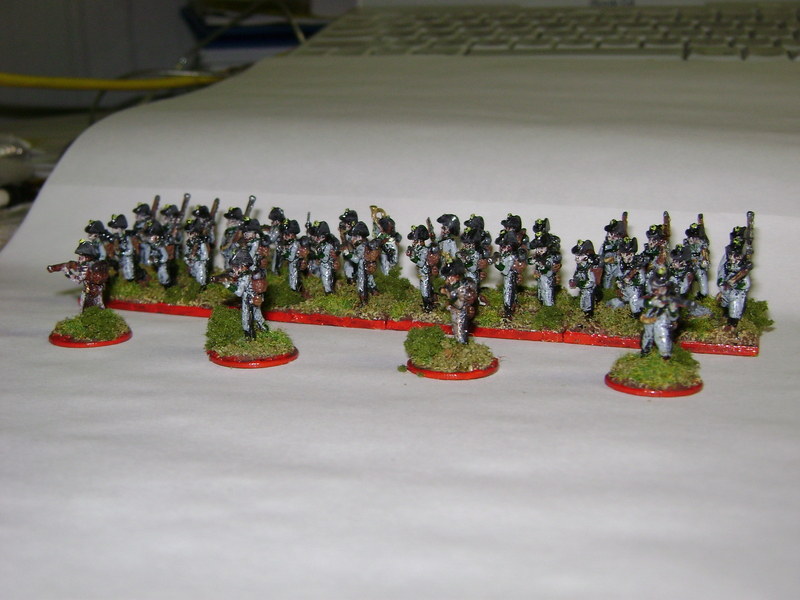 I ended up with a few spare figures, so I based them on dimes to use as skirmisher bases. I think I’ll do this with the other units too. I have 4 skirmisher bases for the Jagers – it’s a SK2 unit, but if I decide to split it out into 4 skirmisher bases, I can do so. My skirmisher bases for all units are going to be a single figure mounted on a dime, I think. As far as painting goes, I used dark flesh then flesh for well, the fleshy parts, boots and other leather was black with a really faint highlight of very dark grey. The coats on the top of the packs were black, drybrushed dark grey. 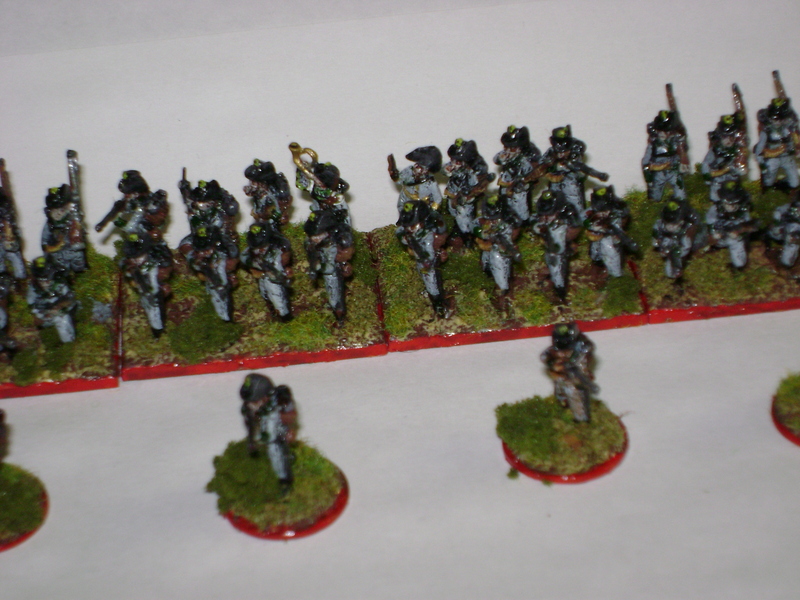 Uniforms were dark grey, with a heavy highlight of light grey, and a light drybrush in an even lighter grey. Guns were dark brown drybrushed lighter brown for the wood, and gunmetal drybrushed silver for the metal parts. Hats were lack, drybrushed with very dark grey, as were pouches etc. Powder horns were medium brown drybrushed light brown, and the packs were dark brown, drybrushed medium brown. Other decoration was gold (horn, commander’s sash etc), the ponpoms yellow and black, and the facings dark green. For the bases, I used air-drying clay and coarse gel, painted dark brown, then highlighted light brown, added flock, grass and some bushes here and there, as well as a couple of clay rocks. on February 14, 2010 at 1:11 pm | Reply David L.